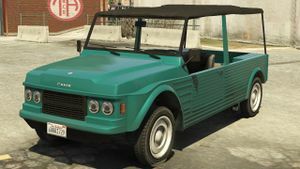 A Kalahari in GTA V.
The Canis Kalahari is an off-road vehicle in Grand Theft Auto V, introduced in the Beach Bum Update. It is based on the Citroën Méhari; however, unlike its real-life counterpart, which is a front wheel drive vehicle, the Kalahari is rear wheel drive. This page was last modified on 13 April 2014, at 20:41.